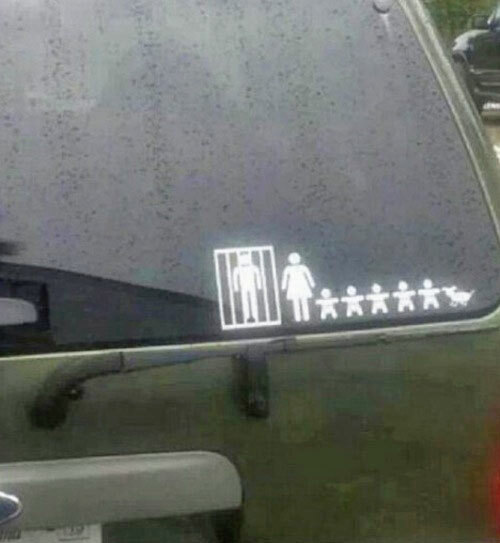 There seems to be stick figure family car decals for every type of family out there, whether you're rich because you have no kids, you're a poor lonely soul with a family consisting of 20 cats, or have 10 kids with 6 fathers in prison. This family car decal consists of 5 kids, 1 mother, and 1 father behind bars in prison, but feel free to buy multiple decals if this doesn't reflect the true number of fathers behind bars or number of illegitimate children you may have. No longer will strangers on the road with you wonder where the father of the 10 children you have in your passenger van, now they will know, all six of them are in prison. 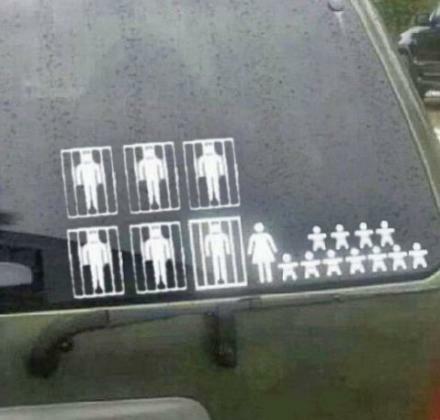 The dads in jail stick figure car decal is made from high quality oracal vinyl, is temperature resistant, has a lifespan of 5-7 years (much like your husbands prison sentence), comes in sizes ranging from 8 inches in width all the way up to 18 inches in width depending now how clear you'd like to be about the status of your family, and comes in a plethora of different colors to choose from if white is not your color of choice.